Today I wanted to put together a comparison review between two of my favorite ebook readers, the Kindle Voyage and Onyx Boox M96, to show how each has it’s own set of unique features, and how the devices are at two opposite ends of the ebook reader spectrum, both in terms of hardware and software. Since Amazon discontinued the 9.7-inch Kindle DX, the M96 pretty much has no competition in the large ereader market, which is a shame because larger E Ink screens have a lot of advantages. Maybe someday Amazon will release a new Kindle DX, if Fire tablet sales continue to tank, but it doesn’t seem very likely after nearly five years since the last DX was released. The main selling points for the Kindle Voyage are the high resolution 300 ppi screen, the frontlight, the page turn sensor buttons, the lightweight, portable design, the capacitive touchscreen, and flush display. The main selling points for the Onyx Boox M96 are the large 9.7-inch E Ink screen, the open Android 4.0 operating system with Google Play support, the advanced PDF features, the memory card slot, support for audio, Bluetooth, and the ability to add hand-written annotations onscreen with the stylus. 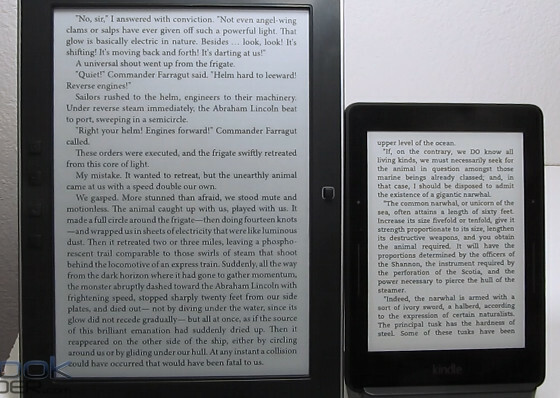 Screen Size: 9.7-inch for the M96; 6-inch for the Voyage, same as the Paperwhite and entry-level Kindle. Resolution: The Kindle Voyage has twice as many pixels as the M96: 300 ppi vs 150 ppi. The difference is most apparent with small font sizes and images with fine details. Frontlight: The Kindle Voyage has a frontlight to illuminate the screen and improve contrast; the M96 has no light source, so a lamp or reading light is needed in low light. Touchscreen: The Kindle Voyage has a capacitive touchscreen with two-point touch for pinch-zooming; the Onyx Boox M96 has an electromagnetic touchscreen that requires using a special stylus, which makes pinch-zooming impossible. Operating System: The Kindle Voyage has a basic operating system with few customization options, but it runs smoothly and offers a lot of features for ebooks; the M96 runs Android 4.0 and can be customized with a number of apps. It can even run the Kindle for Android app, but overall operation isn’t as fast and smooth as the Voyage. Audio: The M96 has an external speaker and headphone jack for listening to music and using text-to-speech; none of the Kindle ereaders support audio anymore. Storage: Both devices come with 4GB of internal storage space and 512MB of RAM, but the M96 also offers an SD card slot for expansion. Bluetooth: The M96 supports Bluetooth for connecting things like wireless headphones and Bluetooth keyboards. Buttons: On the left side of the screen, the M96 has two page buttons, a menu button, and a back button, along with a four way controller/selector button on the right side of the screen that can be used for most navigation without using the touchscreen. Aside from the power button, the Kindle Voyage doesn’t have real buttons. Instead it has sensors on each side of the screen that detect when you press them to turn pages forward and back. Weight: The Kindle Voyage weighs in at 6.3 ounces – 180 grams; the Onyx Boox M96 weighs 17.9 ounces – 509 grams. Price: The Kindle Voyage is $199 for the base model with ads, and works all the way up to $289 for the non-ad model with 3G wireless; the M96 sells from different places around the world—the cheapest option in the US is to get if from Amazon for $339. For more information about each device, see the Kindle Voyage review and Onyx Boox M96 review. I can’t believe I’ve owned the DX for 5 years. I bought it for my mom. She prefers hard-copy books but I have her using this cos I can adjust the font. Here’s the advantage of the DX: mom has neuropathy (numbness) in her fingers and has never gotten the hang of touch screens. She either can’t turn pages or loses her place. She has some dementia and many vision issues. But she manages to read. Having a non-touch screen kindle is very important. She wouldn’t be able to read without it. I know, it’s hard to believe it’s been that long since the Kindle DX was released. There should be more large screen ereaders for senior citizens and people with vision problems—I don’t know why there aren’t more options. Excellent comparison and, as always, whenever I watch one of your videos on the Onyx Boox M96, I want to run out and buy one! What’s stopping me? Well, in one hyphenated word, the parabola-crushing price! I won’t be able to hold out for much longer though and your videos on the M96 edge me closer and closer to buying one just for reading technical PDFs. Thanks for the luminosity. I wish there were more large screen E Ink ereaders on the market, then the price wouldn’t be so high and there would be more demand for innovation. Hopefully the M96 shows other manufacturers that there is a market for these kind of devices and they can be quite successful. It be great Ereader for my dad but isn’t there any Ereader 8inch and bigger with light?? Hi, i’m been for a while looking at the m96 as i realize its the best device for large pdfs. I think im almost ready to pull the trigger and get it but their are two things that i’m curious about; How is the battery with the wifi is on( with email setup to synchronize). I’m also curious in knowing how long will it last if one just browses the web. Sorry but I almost never use the M96 for those kind of things so cannot offer any personal advice. Web browsing and email on E Ink is just too slow and painful when I’ve almost always got an iPad or PC nearby. I mostly use the M96 for PDFs, tablature, and occasionally ebooks. I keep WiFi off unless I’m using it and the battery can last upwards of 1 month. Thanks for your response Nathan, i guess your right its more convenient and less of a hassle to use a tablet or a computer for the web. the battery life on the boox is appealing as i’m always on the go and don’t have to worry about charging it.